Fig and Peach Anthotyro Cheese Tart is a beautiful and delicious dessert to finish a meal with family. I made the tart shell from scratch and used anthotyros, yoghurt and eggs for the filing. The jam is similar to my old fig jam, only in this one I also added some peaches. After baking the tart I added a jar of jam on top and baked it again for ten more minutes. Flashback six years ago. In 2007 was the year I decided to take early retirement. To fill my spare time, I started copying my old recipes, as my scrapbooks were torn, greasy and falling apart. I decided that it would be better to copy them on my computer so that in the future I could give a copy to my children, as back then they were not so interested in learning how to cook, probably because they were content finding everything ready. That year my elder son was working in Crete, so early in July we went on vacations there to visit him. In August, as is usual for Greece, it is the month that 90% of the population take their annual leave and Athens was a ghost town. There was nowhere to go and nothing to do, television was showing reruns, our friends were on vacation, so I was feeling very bored. My son had some days off at the end of August, so when he came to visit us, I was telling him how bored I was feeling. That’s when he popped the idea: “Mum”, he said, “since you love cooking and have tons of recipes to share, why don’t you create a food blog? This way you will have a hobby, you will start writing and sharing your recipes, which will be there for us to refer to in the future and you will also start communicating with other people”. I liked the idea and created a free blogger blog which was called “Ivy’s Household Recipes and Advice” with all those words in the URL!!! I had no clue about blogging and how it worked but I started a bilingual blog, in English and in Greek. In Greece there may have been a handful of food bloggers at the time but the first comments came from abroad, so that was the reason, a few months later I decided to separate it into two blogs, so that those reading my posts did not have to read it in Greek as well. I now believe that that was a huge mistake. My archives show that I started my first blog post in September and the English one in November but the fact is that at some time later on, I deleted a few of the first posts which seemed a bit silly and not totally food related. After publishing my cookbook, I decided to create a blog for its promotion and then before moving to Assini I created another one to record the progress of our relocating there and when we finally moved, I was thinking of starting a business, which would be culinary related. This is when I started my cooking classes a couple of years later. Blogging turned out to be very tiring and I can’t catch up. There are times I think that I should give up all the blogs I have created and just focus on one. I might do that soon but I am torn which of the two main blogs I should give up. This is something to think about in the future. Well that was the beginning of blogging and only a few bloggers I know started earlier. The only obstacle of starting earlier was the high cost of internet charges at the time, apart from the fact how slow it was and nerve-racking. I had an internet connection many years before, but I just used it to check my business e-mails and then log off. It took hours to download a song from “Napster” (do you remember Napster?) and searching information was a torture, which in the end I would give up not to mention how much it cost! During 2007, we had an ADSL connection so blogging was much cheaper and easier. What a great tool was a blogging. So many new horizons were open to us. We learned so much about other cultures, we learned about recipes we never heard of and about ingredients that we didn’t even know existed and still until today I keep learning so many new things from my blogger friends. There was a time (innocent years) that we exchanged awards and played memes but blogging also evolves. Too many social networks have helped us promote our work and food bloggers now make money out of blogging. There’s nothing wrong about that, so long as it still remains a hobby and not hire someone to comment on your behalf and do most of the promoting jobs for you. Yes, bloggers of 2013 tend to do this as I’ve read this in a food group I am a member. During these past six years, I’ve made a lot of friends, some of which are from that period and even had the pleasure to meet them personally. Some have taken different paths, some have quitted blogging and some have unfortunately “left” us, but their memory is alive in our thoughts and through their recipes, which are there to remind, us how wonderful these persons were and we still enjoy some of their delicious creations. I’d like to take this opportunity to say to my fellow food bloggers that I’m sorry if I am not visiting your blogs as often as I would like to. After three years since I self-published my first cookbook, now three years later I am about to self-publish my second cookbook. Real life isn’t easy and after the economic crisis and cut offs from our pensions, a little bit of extra pocket money is always welcome. That alone is a full time job (but only as regards time) with a few breaks to relax and get updated on Facebook. I hope that when the book is published I will be back to normal blogging habits again. I am also very grateful to those anonymous readers, which I meet in my google statistics, who are looking for something to cook. Thank you for keeping visiting my blog, for taking time to read my posts and hope that I may have helped some people to love Greek food. To celebrate this milestone, I have created a Greek cheese Tart with Fig and Peach Jam. Actually, I wanted to make a tart with fresh figs but when a friend gave us all these figs, I had already prepared a dessert, so by the time we ate the first one, the figs had to be preserved, as they don’t have a long shelf life. I made the jam in which I also added some ripe peaches. To keep the jam low on calories, I added less sugar, some honey and stevia. It was not overly sweet but for using it in desserts, it was perfect and I love it on toasted bread for breakfast. To make the filling, the only ingredients I had available at the time was some anthotyros (a Greek whey cheese, similar to ricotta), some eggs, Greek yoghurt and my fig jam, so I improvised and made this Tart. When making the tart shell, I also prepared my second video. I didn’t plan to make a video but it was a decision at the spur of the moment so, I set the camera on the tripod, pressed the button and started shooting! Bake the tart shell for 15 minutes. Remove it from the oven and remove the parchment with beans. Whisk an egg white (half is enough) with a fork and brush the surface of your tart. Put it back in the oven and bake for five more minutes. (It should not be completely baked, as it will continue baking with the filling). Whisk the remaining eggs with sugar until fluffy. Add the cheese, yoghurt, corn flour and masticha sugar and whisk until incorporated. Stop the mixer, clean the sides of the bowl, and continue whisking for one more minute. Empty over the tart shell and bake for 15 more minutes. Remove from the oven and add 1 jar of homemade peach and fig jam. Add spoonfuls to cover the whole surface and then gently spread all over. Bake again for 10 more minutes. When it cools, store it in the refrigerator. Serve with Kaimaki ice cream (optional). The time refers only to the preparation of the filling and baking after the filling is added. Happy Bloganniversary and to many more! I am so happy to have met you. You are such a kind and generous person, and your creations are wonderful. This tart looks incredibly tempting and delicious! Heartiest congratulations on your 6th blog anniversary! You know that for me your blog is a gem of a place. AS for reducing the number of blogs is a good idea indeed. It can get too much. For me you are one amazing cook and baker. Happy Anniversary of blogging! It’s been so fun to follow along with all of your cooking over the years. 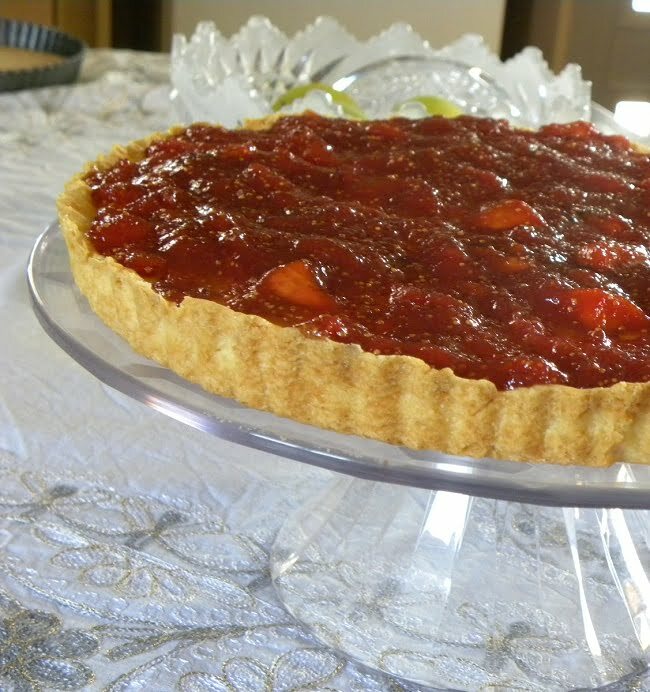 This tart looks lovely with the summer fruit jam on top! Congratulations Ivy. You’ve come a long way in 6 years! Ivy mon amie, c’est toujours un plaisir de te lire. J’espère que tu continueras à bloguer et à nous publier toujours de bonnes recettes. J’aime beaucoup cette tarte. Elle doit être délicieuse. This tart looks delicious, what a beautiful way to celebrate such an event. The tart looks fabulous! Perfect for the celebration.